Büttner with Dynamo Moscow in 2014. Alexander Büttner (pronounced [ɑlɛˈksɑndər ˈbɵtnər]; born 11 February 1989) is a Dutch footballer who plays as a left back for Vitesse. Born in Doetinchem, Büttner began his career with local club VV Doetinchem, but spent his formative years with Ajax before joining Vitesse at the age of 16 in 2005. After progressing through the ranks at the youth system and reserves, Büttner made his professional debut for Vitesse on 15 March 2008 against Twente after coming on as a substitute for Haim Megrelashvili in the 6th minutes following his poor performance. However, after coming on as a substitute for Megrelashvili, he played until he received a straight red card after a second bookable offence, in a 4–3 loss. This turns out to be his only appearance in the 2007–08 season. In the 2008–09 season, Büttner then made his first start for the club, where he played the whole game, in a 1–1 draw against Sparta Rotterdam on 20 September 2008. Having established himself in the starting eleven, Büttner then scored his first goal for the club in a 3–1 home win over Volendam on 20 December 2008. Although he appeared on the substitute bench as the season progressed, Büttner regained his first team place and went on to score two goals in two matches between 18 April 2009 and 26 April 2009 against AZ and Utrecht. At the end of the season, Büttner went on to make twenty-three appearances and scoring three times in all competitions. In the 2009–10 season, Büttner signed his contract and continued to be involved in the first team, competing with Jeroen Drost and Gino Felixdaal over the left-back position, although he spent time the first half of the season, coming on as a substitute. Büttner soon managed his left-back position in the first team and went on to score two goals later in the season against Groningen and Roda JC. At the end of the 2009–10 season, Büttner made twenty-nine appearances and scored two times in all competitions. In the 2010–11 season, Büttner fully established himself as a left back in the first team. His performance soon attracted interests clubs around Europe from Polish clubs Legia Warsaw and Lech Poznań, but the transfer move never happened and becausee of this, he appeared on the substitute bench since the end of January, as well as, his own injury concerns. He managed to regain his first team place after the failed transfer move and went on to make twenty-five appearances in all competitions. With his contract expiring at the end of the season, the club opened negotiations with Büttner over a new contract. Eventually, Büttner signed a contract extension, keeping him until 2011. In the 2011–12 season, Büttner started the season well when he set up two goals, in a 2–1 win over Utrecht on 20 August 2011, followed up by scoring his first goal of the season, in a 4–1 loss against Ajax. Three weeks later, on 17 September 2011, Büttner scored his second goal of the season, in a 5–0 win over Roda JC. Throughout the season, he continued to be in a regular first team, playing either left-back and left-midfielder. Because of this, his performance further attracted interests from clubs, such as, AZ and Twente. It wasn't until on 12 April 2012 when he scored his third goal of the season, in a 3–1 win over VVV-Venlo. On 28 April 2012, Büttner scored a brace, in a 3–2 win over Excelsior. Although he suffered a toe injury in the next game, Büttner returned to the next game from injury on the last game of the season, in a 3–1 loss against Ajax. At the end of the season, Büttner went on to make thirty-nine appearances and scoring five times in all competitions. For his performance, Büttner was voted by the fans as Vitesse player of the year. On 6 July 2012, Vitesse agreed a fee with Southampton over the transfer of Büttner to the English club, subject to a medical. The proposed move to Southampton was subsequently halted "due to an unspecified 'demand' from an unnamed third party"; this was believed to be a claim for a percentage of the transfer fee. On 21 August 2012, Büttner signed a five-year contract with Manchester United, where he was given the number 28 shirt. Büttner made his league debut on 15 September, setting up the second goal and scoring the third, in a 4–0 home win against Wigan Athletic. His performance gained him the man of the match award. On 23 October, he made his UEFA club competition debut in a 3–2 home victory over Braga in the group stage of the 2012–13 UEFA Champions League. On 5 January, Büttner made his FA Cup debut in a 2–2 draw against West Ham United. United went on to win the Premier League and Büttner received a winner's medal by a special dispensation given by the manager. He scored his second goal for Manchester United on the final day of the season in a dramatic 5–5 draw against West Bromwich Albion. After collecting a pass from Tom Cleverley in the inside left channel, he drove into the penalty area and fired a low shot into the far corner. Although he made thirteen appearance and scoring two times in all competitions, Büttner said he credited his girlfriend and brother to overcome homesickness. In the 2013–14 season, Büttner struggled to regain his first team place in his second season at the club, as Patrice Evra was preferred in the left-back under the management of David Moyes. In the summer transfer window, he was expected to leave the club on loan to Beşiktaş, but Moyes blocked the move from happening. Despite this, Büttner made his first appearance of the season on 25 September 2013, where he played as a left-back, in a 1–0 win over Liverpool in the second round of League Cup. It wasn't until late-March when Büttner had a handful of first team appearances following Evra's injury. Büttner's performance even earned praises from Evra. At the end of the 2013–14 season, Büttner made fifteen appearances for the club in all competitions. Büttner playing for Dynamo Moscow in the UEFA Europa League match against Omonia, in which he scored during the match. 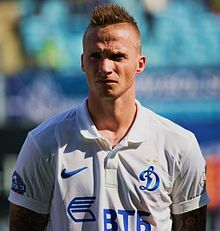 On 24 June 2014, Büttner announced that he was leaving Manchester United for Dynamo Moscow, on a three-year deal for £4.4 million potentially rising to £5.6 million. He cited a lack of playing time and a personal rift between himself and United coach Louis van Gaal as the reason of his departure. Büttner made his Dynamo Moscow debut, where he made his first start for the club, in a 1–1 draw against Hapoel Ironi Kiryat Shmona in the first leg of the third round of the UEFA Europa League and went through to next round after winning 2–1 on aggragate in the second leg. Days later, he made his league debut for the club, in the opening game of the season, in a 7–3 win over Rostov. Weeks later on 21 August 2014, he scored his first goal for Dynamo Moscow in a 2–2 draw against Cypriot club Omonia in the Europa League. Büttner, however, was sent-off in the UEFA Europa League match against Anderlecht after receiving a second bookable offence, in a 0–0 draw. Later in the season, he received a red card again for a second time this season on 24 May 2015, in a 2–2 draw against Arsenal Tula. In his first season at the club, Büttner made thirty-one (19 in the league) and scoring once in all competitions. Büttner taking a kick in the UEFA Europa League match against Estoril. In his second season at Dynamo Moscow, however, Büttner suffered an injury at the start of the season. He then made his return to the first team from injury, in a 1–1 draw against Lokomotiv Moscow. However, this turns out to be his only appearance, as he suffered injuries by the first half of the season. Following his loan spell at Anderlecht came to an end, Büttner expressed desire to leave the club in the summer transfer window, with clubs around Europe keen on signing him, but stayed at the club throughout the summer. Despite this, he returned to the first team and was given a number twenty-four shirt. Büttner made his first appearance for the club in a year on 12 October 2016, where he played the whole game, in a 0–0 draw against Khimki. In December 2016, with four appearance this season, Büttner was released by the club, in the wake of the club's financial difficulties. After leaving the club, Büttner reflected his time at the club, stating that he enjoyed his first season at the club, but became disillusioned in his latter career there, citing the departure of the club's president, Boris Romanovich Rotenberg, and players subsequently left the club as a result. On 1 February 2016, he agreed to join Belgian side Anderlecht on loan until the end of 2015/16 season. It came after when his agent hinted his departure from Dynamo Moscow in the January transfer window. On 5 February 2016, Büttner made his Anderlecht debut in a 2–2 draw with KV Mechelen, featuring for the entire 90 minutes. A week later, Büttner went onto score his first goal for Anderlecht, netting the second in the Belgian side's 3–0 victory over Zulte Waregem. In a match against Kortrijk on 13 March 2016, Büttner set up two goals, in a 3–0 win. Later in the 2015–16 season, Büttner became a first team regular at the club, but was unsuccessful to win the league, as they finished second place. At the end of the 2015–16 season, making sixteen appearance and scoring once in all competitions, Büttner returned to his parent club after Anderlecht decided against signing him on a permanent basis. On 16 January 2017, Büttner returned to Vitesse, signing a 2.5-year contract with the club. Upon re-joining the club, he was a replacement for Kosuke Ota, who returned to FC Tokyo. Büttner made his second Vitesse debut on 19 February 2017, where he came on as a second-half substitute, in a 1–0 loss against Ajax. Büttner has represented the Netherlands at under-20 and under-21 levels. On 7 May 2012, Büttner was named in the provisional list of 36 players for the UEFA Euro 2012 tournament, one of nine uncapped players to be chosen by Netherlands manager Bert van Marwijk as part of the preliminary squad. However, Büttner was among seven players to be cut from the squad after van Marwijk reduced his squad to 27 players on 15 May 2012. Two years after being cut from the squad, Büttner expressed hope he would be called up by the national team one day, but this never happened. Büttner playing for the side in a league match against rival's Spartak Moscow. Born in Doetinchem, Netherlands, Büttner grew up in a football-loving family. Like Büttner himself, his two brothers and father are also footballers. Growing up, Büttner revealed that his father was very strict on him. ^ "Premier League Clubs submit Squad Lists" (PDF). Premier League. 4 February 2014. p. 22. Archived from the original (PDF) on 9 August 2014. Retrieved 26 March 2014. ^ "Player Profile: Alexander Büttner". premierleague.com. Premier League. Retrieved 31 July 2012. ^ a b "Alexander Büttner, talent bij Ajax, doorbraak bij Vitesse" (in Dutch). De Gelderlander. 26 September 2008. Archived from the original on 28 September 2008. Retrieved 16 March 2017. ^ "The earliest ever tactical substitutions". The Guardian. 9 April 2008. Retrieved 16 March 2017. ^ "Mols op zijn oude dag in hoofdrol bij Feyenoord" (in Dutch). De Volkskrant. 17 March 2008. Retrieved 16 March 2017. ^ "Vitesse en Sparta moeten beide blij zijn met één punt" (in Dutch). Voetbal International. 20 September 2008. Retrieved 16 March 2017. ^ "Vitesse wint maar oogst fluitconcerten tegen Volendam" (in Dutch). Voetbal International. 20 December 2008. Retrieved 16 March 2017. ^ "Toevalstreffers Vitesse bezorgen AZ anti-climax" (in Dutch). Voetbal International. 18 April 2009. Retrieved 16 March 2017. ^ "Vitesse kleineert onthutsend zwak FC Utrecht" (in Dutch). Voetbal International. 26 April 2009. Retrieved 16 March 2017. ^ "Van Diermen en Büttner zetten Vitesse in wachtkamer" (in Dutch). FC Update. 15 August 2009. Retrieved 17 March 2017. ^ "Gifkikker Büttner maakt indruk" (in Dutch). SBV Vitesse. 28 October 2009. Archived from the original on 16 March 2017. Retrieved 16 March 2017. ^ "Vitesse naar twaalfde plaats na winst op Groningen" (in Dutch). Voetbal International. 3 April 2010. Retrieved 16 March 2017. ^ "Roda verslaat Vitesse en mag hopen op play-offs" (in Dutch). Voetbal International. 18 April 2010. Retrieved 16 March 2017. ^ "Drost vervangt Büttner tegen NAC Breda" (in Dutch). FC Update. 17 December 2010. Retrieved 17 March 2017. ^ "Meer concrete belangstelling uit Polen voor Büttner" (in Dutch). Voetbal International. 28 February 2011. Retrieved 16 March 2017. ^ "Gewilde Büttner: 'Heb het naar mijn zin bij Vitesse'" (in Dutch). Voetbal International. 18 April 2011. Retrieved 16 March 2017. ^ "Alexander Büttner verlengt contract met 2 jaar" (in Dutch). SBV Vitesse. 30 May 2011. Archived from the original on 16 March 2017. Retrieved 16 March 2017. ^ "Vitesse verrast 'woedend' FC Utrecht in turbulente slotfase" (in Dutch). de Volkskrant. 20 April 2011. Retrieved 16 March 2017. ^ "Ajax heeft na rust geen kind aan piepjong Vitesse" (in Dutch). Het Parool. 26 August 2011. Retrieved 16 March 2017. ^ "Swingend Vitesse geeft Roda JC flink pak slaag" (in Dutch). Het Parool. 17 September 2011. Retrieved 16 March 2017. ^ "FC Twente en AZ denken ook aan Alexander Büttner" (in Dutch). Voetbal International. 19 December 2011. Retrieved 16 March 2017. ^ "Wisselvallig Vitesse pikt punten mee tegen onmachtig VVV" (in Dutch). Het Parool. 12 April 2012. Retrieved 16 March 2017. ^ "Excelsior verliest opnieuw in extra tijd, nu van Vitesse" (in Dutch). De Volkskrant. 28 April 2012. Retrieved 16 March 2017. ^ "Utrecht kan Vitesse niet afschudden" (in Dutch). De Volkskrant. 28 April 2012. Retrieved 16 March 2017. ^ "Alexander Büttner in beeld bij Ajax" (in Dutch). Het Parool. 7 May 2012. Retrieved 16 March 2017. ^ "Büttner volgens Vitesse-supporters speler van het jaar" (in Dutch). Soccer News. 19 May 2012. Retrieved 17 March 2017. ^ "Vitesse en Southampton akkoord over Büttner". Vittesse.nl (in Dutch). Vittesse. Archived from the original on 9 July 2012. Retrieved 6 July 2012. ^ "Southampton deal for Alexander Buttner in doubt". BBC Sport. British Broadcasting Corporation. 6 July 2012. Retrieved 6 July 2012. ^ Coppack, Nick (21 August 2012). "Büttner signs for United". ManUtd.com. Manchester United. Retrieved 21 August 2012. ^ Coppack, Nick (24 August 2012). "Büttner's no. confirmed". ManUtd.com. Manchester United. Archived from the original on 4 November 2012. Retrieved 24 August 2012. ^ Smith, Ben (15 September 2012). "Man Utd 4–0 Wigan". BBC Sport. British Broadcasting Corporation. Retrieved 15 September 2012. ^ Tuck, James (17 September 2012). "Büttner bags Wigan award". ManUtd.com. Manchester United. Archived from the original on 25 November 2012. Retrieved 17 September 2012. ^ McNulty, Phil (23 October 2012). "Man Utd 3–2 Braga". BBC Sport. British Broadcasting Corporation. Retrieved 23 October 2012. ^ Chowdhury, Saj (5 January 2013). "West Ham 2–2 Man Utd". BBC Sport. British Broadcasting Corporation. Retrieved 17 January 2013. ^ Tuck, James (26 April 2013). "Sir Alex: Squad Reds get medals". ManUtd.com. Manchester United. Retrieved 26 April 2013. ^ "Sir Alex Ferguson signs off with thriller as Manchester United draw 5–5 with West Brom". Sky Sports. 19 May 2013. Retrieved 16 March 2017. ^ "Büttner dankt vriendin en broer" (in Dutch). Goal.com. 16 June 2013. Retrieved 16 March 2017. ^ "David Moyes is ready to let Alexander Buttner go after failing to impress Manchester United boss". Daily Mirror. 5 October 2013. Retrieved 16 March 2017. ^ "Manchester United's Alex Buttner claims boss David Moyes has brought him in from cold". Daily Mirror. 6 September 2013. Retrieved 16 March 2017. ^ "Manchester United 1 – 0 Liverpool". BBC Sport. 25 September 2013. Retrieved 16 March 2017. ^ "Büttner moet Robben in toom houden op Old Trafford" (in Dutch). Voetbal International. 1 April 2014. Retrieved 16 March 2017. ^ "Evra: 'Büttner heeft het goed gedaan'" (in Dutch). Voetbal International. 7 April 2013. Retrieved 16 March 2017. ^ "Alexander Buttner signs for Dynamo Moscow from Man Utd". BBC Sport. 24 June 2014. Retrieved 24 June 2014. ^ Richard Jolly (24 June 2014). "Buttner agrees Dinamo Moscow move". ESPN. Retrieved 24 June 2014. ^ "Alexander Büttner says he left Manchester United to 'win trophies'". The Guardian. 24 June 2014. Archived from the original on 24 June 2014. Retrieved 24 June 2014. ^ "Бюттнер: для меня матч с "Хапоэль Ирони" прошёл неплохо, "Динамо" могло победить" (in Russian). Championat.com. 31 July 2014. Retrieved 17 March 2017. ^ "Кипр принёс "Динамо" удачу" (in Russian). Championat.com. 7 August 2014. Retrieved 17 March 2017. ^ "Кокорин: думал, будут другие эмоции от хет-трика" (in Russian). Championat.com. 3 August 2014. Retrieved 17 March 2017. ^ "Кураньи: "Динамо" должно сделать выводы перед ответной игрой с "Омонией"" (in Russian). Championat.com. 21 August 2014. Retrieved 17 March 2017. ^ ""Динамо" вдесятером отстояло ничью в гостевом матче с "Андерлехтом"" (in Russian). Championat.com. 19 February 2015. Retrieved 17 March 2017. ^ ""Динамо", играя вдесятером, свело к ничьей домашний матч с "Арсеналом"" (in Russian). Championat.com. 24 May 2015. Retrieved 17 March 2017. ^ "Виллаш-Боаш: Дзюба, Юсупов и вся команда прибавляют" (in Dutch). Championat.com. 19 July 2015. Retrieved 17 March 2017. ^ ""Локомотив" и "Динамо" сыграли вничью" (in Russian). Championat.com. 2 August 2016. Retrieved 17 March 2017. ^ "Бюттнер приступил к тренировкам по индивидуальной программе" (in Russian). Championat.com. 3 September 2015. Retrieved 17 March 2017. ^ ""Краснодар" — "Динамо": Жирков, Самба и Бюттнер пропустят матч из-за травм" (in Russian). Championat.com. 13 September 2015. Retrieved 17 March 2017. ^ "Жирков и Бюттнер вернулись в строй перед матчем со "Спартаком"" (in Russian). Championat.com. 22 October 2015. Retrieved 17 March 2017. ^ "Орещук: Бюттнер хочет уйти из "Динамо"" (in Russian). Championat.com. 13 July 2016. Retrieved 17 March 2017. ^ "Орещук: по Бюттнеру было достаточно предложений, но его агент всё запорол" (in Russian). Championat.com. 3 September 2016. Retrieved 17 March 2017. ^ ""Динамо" заявило Бюттнера на ФНЛ" (in Russian). Championat.com. 22 July 2016. Retrieved 17 March 2017. ^ ""Динамо" сыграло вничью с "Химками" в перенесённом матче 13-го тура ФНЛ" (in Russian). Championat.com. 12 October 2016. Retrieved 17 March 2017. ^ "Бюттнер подтвердил, что расторг контракт с "Динамо"" (in Russian). Championat.com. 16 December 2016. Retrieved 17 March 2017. ^ "Бюттнер: первый год в "Динамо" был хорошим, но потом внезапно пропал президент" (in Russian). Championat.com. 17 January 2017. Retrieved 17 March 2017. ^ "Anderlecht heeft Büttner beet en vindt middenvelder in Turkije" (in Dutch). Sporza.be. 1 February 2016. Retrieved 17 March 2017. ^ "Агент: Бюттнер покинет "Динамо" зимой" (in Russian). Championat.com. 29 October 2015. Retrieved 17 March 2017. ^ "Anderlecht krikt niveau op, maar blijft steken op gelijkspel tegen KVM" (in Dutch). Sporza.be. 5 February 2016. Retrieved 17 March 2017. ^ "Anderlecht wint overtuigend tegen Zulte Waregem" (in Dutch). Sporza.be. 13 February 2016. Retrieved 17 March 2017. ^ "Anderlecht stelt orde op zaken tegen Kortrijk, vel van Hasi is gered" (in Dutch). Sporza.be. 13 February 2016. Retrieved 17 March 2017. ^ "Бюттнер, судя по всему, покинет "Андерлехт", но оставаться в "Динамо" не намерен" (in Russian). Championat.com. 24 May 2016. Retrieved 17 March 2017. ^ "ALEXANDER BÜTTNER TERUG BIJ VITESSE" (in Dutch). SBV Vitesse. 16 January 2017. Archived from the original on 18 January 2017. ^ "Büttner: 'Gevoel zei dat ik voor Vitesse moest kiezen'" (in Dutch). Voetbal International. 16 January 2017. Retrieved 16 March 2017. ^ "Ajax zet pover duel toch om in winst" (in Dutch). Het Parool. 19 February 2017. Retrieved 16 March 2017. ^ "Alexander Büttner in Beloftenelftal" (in Dutch). SBV Vitesse. 7 October 2009. Archived from the original on 16 March 2017. Retrieved 16 March 2017. ^ "Debutant Büttner vervangt geblesseerde Pieters" (in Dutch). Het Parool. 7 May 2012. Retrieved 16 March 2017. ^ "Van Marwijk cuts provisional Dutch squad to 27". UEFA Official Website. 15 May 2012. Retrieved 17 March 2017. ^ "Бюттнер: рассчитываю, что из "Динамо" смогу получить вызов в сборную Нидерландов" (in Russian). Championat.com. 29 June 2014. Retrieved 17 March 2017. ^ "ESPN – Alexander Büttner stats". ESPN Soccernet. Entertainment and Sports Programming Network (ESPN). Retrieved 15 September 2012. ^ "Voetbal International – Alexander Büttner stats". Voetbal International. Retrieved 15 September 2012. ^ "Бюттнер: мой отец строже, чем Черчесов" (in Russian). Championat.com. 1 May 2015. Retrieved 17 March 2017. ^ "Alexander Büttner: Overview". Premier League. Retrieved 16 April 2018. This page is based on the Wikipedia article Alexander Büttner; it is used under the Creative Commons Attribution-ShareAlike 3.0 Unported License (CC-BY-SA). You may redistribute it, verbatim or modified, providing that you comply with the terms of the CC-BY-SA.